Yitzhak Rabin (Hebrew: יִצְחָק רָבִּין) (March 1, 1922 – November 4, 1995) was the fifth prime minister of Israel and the first native-born prime minister of the nation. He was the only prime minister to be assassinated and the second to die in office, following Levi Eshkol (1895-1969). Rabin was a lifelong public servant, serving in such positions as the Israeli Defense Force chief of staff, ambassador to the United States, a member of the Knesset (Israeli parliament) and two terms as prime minister. Rabin had the reputation of being a candid leader, with a brilliant analytical mind. During his tenure, both the Oslo Accords with the Palestinians and the Treaty of Peace with Jordan were signed. Rabin was awarded the Nobel Peace Prize in 1994, following the signing of the Oslo Accords. The Accords greatly polarized his image in Israeli society, some seeing him as a hero for advancing the cause of peace and some seeing him as a traitor for giving away land they saw as rightfully belonging to Israel. He was assassinated by Yigal Amir, a right-wing activist who had strenuously opposed Rabin's signing of the Oslo Accords, while leaving a peace rally on November 4, 1995. At his funeral, which included four thousand invited dignitaries, Rabin was termed a "martyr for peace," and was eulogized by world leaders, including Arabs, who promised that efforts to end religious and ethnic bloodshed in the Middle East would carry on despite the assassination of the Israeli prime minister. Hosni Mubarak of Egypt and King Hussein of Jordan paid tribute to the man who led Israel's forces in the 1967 Middle East War and then sought a lasting peace with Arabs. "You lived as a soldier, you died as a soldier for peace," the Jordanian leader said. Mubarak called Rabin a "fallen hero for peace." Rabin's last words to those who were devoted to peace are his legacy. Speaking to those gathered at the peace rally shortly before he was killed, the prime minister said: "The peace is an open door to economic and social progress. The peace is not only in prayer but it is the true desire of the Jewish people. There are enemies to the peace process, and they are trying to hurt us in order to destroy it. I want to say we have found partners in peace among the Palestinians. Without partners to the peace, there is no peace." Yitzhak Rabin was born in Jerusalem, Israel, which was known at the time as the British Mandate of Palestine, in March 1922. His parents were Nehemiah Rubitzov and Rosa Cohen Rubitzov. His father, who had been born in the Ukraine in 1886, immigrated to Israel from the United States. His mother was born in White Russia in 1890 and arrived in Palestine in 1919 as part of the Third Aliya (immigration wave) pioneers. His father served as a volunteer in the Jewish Legion during World War I, while his mother was one of the first members of the Haganah, the mainstream Jewish defense organization. His parents married in 1921. Yitzhak was born the following year in Jerusalem. The family lived briefly in Haifa, then in Tel Aviv, where Yitzhak grew up and his sister Rachel was born in 1925. The Rabin home nurtured a commitment to public service. Both parents were volunteer activists for most of their lives. Though his father had died when he was a young child, his mother remained active in the Haganah defense organization, in Mapai—the Eretz Israel Workers’ Party—and was a Tel Aviv municipal council member. She died when Yitzhak was 15 years old. Tel Aviv's School for Workers’ Children was established in 1924 by the Histadrut, the General Federation of Labor. Its purpose was to instill in the city’s young people a love of the country and, practically, to raise a generation of people who could work the land. Special focus was made to teach the students to honor responsibility, sharing and solidarity. They also sought to nurture a sense of social activism that the students would carry throughout their lives. Yitzhak Rabin attended this school for eight years, later writing that he had considered the school his second home. He expressed special appreciation of the style of teaching beyond the boundaries of the typical classroom. Following that, Rabin spent two years at the intermediary regional school of Kibbutz Givat Hashlosha. He then enrolled in the Kadoorie Agricultural School, at the foot of northern Mount Tabor, from which he graduated in 1940 with distinction. A number of Rabin's fellow Kadoorie alumni eventually became commanders in the Israeli Defense Forces (IDF) and leaders of the new State of Israel, established in 1948. In 1948, in the midst of the War of Independence, Rabin married Leah Schlossberg. Mrs. Rabin was born in the then-German town of Königsberg (later part of Russia) in 1928. Her family immigrated to Israel immediately following Adolf Hitler's rise to power. The Rabins had two children, Dalia and Yuval. Dalia Rabin-Pelossof is a lawyer serving in the Knesset, and Yuval, who founded a peace organization following his father's assassination, now represents an Israeli firm in the United States. Mrs. Rabin was a staunch supporter of her husband throughout his army and political careers. Following his assassination, she took up the torch for peace, becoming a fierce advocate of his legacy. On November 29, 1947, the United Nations General Assembly agreed to implement the Palestine Partition Plan, designed to divide the territory of Palestine into Jewish and Arab states, with the Greater Jerusalem area, including Bethlehem, coming under international control. The majority of the Jews and Jewish groups accepted the proposal, in particular the Jewish Agency, which functioned as the de facto representative group of the nascent Jewish state. A minority of extreme nationalist Jewish groups such as Menachem Begin's Irgun Tsvai Leumi and the Lehi, which had been fighting the British, rejected it. Begin warned that the partition would not bring peace because the Arabs would also attack the small state and that "in the war ahead we'll have to stand on our own, it will be a war on our existence and future." To this day, Israeli history books mention November 29th (the date of this session) as the most important date in Israel's acquisition of independence, however many criticized the lack of territorial continuity for the Jewish state. The Arab leadership, both inside and out of Palestine, opposed the plan, arguing that it violated the rights of the majority of the people in Palestine, which at the time was 67 percent non-Jewish (1,237,000) and 33 percent Jewish (608,000). Arab leaders also argued a large number of Arabs would be trapped in the Jewish State as a minority. Every major Arab leader objected in principle to the right of the Jews to an independent state in Palestine, reflecting the policies of the Arab League. As a result of this opposition, the Yishuv, the pre-state Jewish community, came under attack by dissenting Arabs in an attempt to thwart the establishment of the Jewish state. Settlements and towns were attacked. The Jewish defense forces were poorly armed and ill-equipped. Nonetheless, the Palmach (the permanently mobilized arm of the Haganah), fought back as best they could. David Ben-Gurion proclaimed an independent State of Israel on May 14, 1948, in Tel Aviv. The following day, the regular armies of the surrounding Arab states invaded the new-born state and the full-blown War of Independence began. One percent of the entire Yishuv, 6,000 Jews, fell during the fight for independence. At the beginning of the war, Jerusalem was cut off from the center of the country by enemy positions. As a member of Palmach, Rabin’s first task was to safeguard convoys of food, ammunition and medical supplies to the beleaguered city. In April 1948, the Palmach Harel Brigade was established with Rabin as Brigade Commander. Rabin played a major role in the fiercest battles on the central front, in the corridor leading to Jerusalem, and within the city. The first truce was declared in June 1948. Rabin, now chief operations officer on the central front, was also deputy commander to the front’s chief commander, Yigal Allon. Allon and Rabin succeeded in "Operation Danny," which was the conquest of Lod, Ramle, Lod Airport and more territory southeast of the city of Tel Aviv. They then moved on to the southern front, which then became the critical one. Following this, for several months in 1948, Rabin served as chief operations officer, creating a successful campaign that drove the Egyptians and Jordanians from the Negev Desert in Operations Yoav, Lot, Assaf, Horev and Uvdah. The War of Independence ended in 1949 with the signing of the armistice agreements. Rabin took part in the Israeli-Egyptian armistice talks in Rhodes, his first brush with diplomacy. Telling of Rabin's character is his relating in his memoirs, Pinkas Sherut, written in Hebrew in the late 1970s, of an episode of the 1948 war that had troubled him since - the forced expulsion by the IDF of 50,000 Arab civilians from the towns of Lod-Ramle. A cabinet committee assigned to check ministerial memoirs for security leaks ordered that the section be removed and indeed, against Rabin's wishes, it was. The story was revealed by the English translator of the book and published in The New York Times. The Israel Defense Forces were formed following the declaration of the establishment of the State of Israel, with the purpose to "defend the existence, territorial integrity and sovereignty of the state of Israel" and "to protect the inhabitants of Israel and to combat all forms of terrorism which threaten daily life." The predecessors to the IDF were the Haganah (in particular, its operative detachment, the Palmach) and the British armed forces, in particular the Jewish Brigade that fought as part of the British army during World War II. David Ben-Gurion's first order following the proclamation of the State of Israel was the formation of the IDF. Rabin was appointed commander of the IDF's first course for battalion commanders. He formulated the IDF’s combat doctrine with the assistance of his junior officers. The completed doctrine held special emphasis on the instruction, training standards and principles of the various army units, from the individual level to division level. Rabin later served as head of the general staff’s Operations Division, who had the monumental task of administration of the transit camps. These camps housed more than 100,000 new immigrants who arrived in Israel in the waves of aliya after independence, many from Muslim countries. Severe floods hit the camps in both 1951 and 1952 - the IDF's assistance at this time was vital. 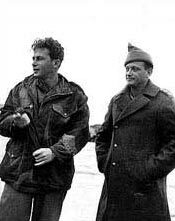 Rabin became chief of the Operations Branch, the second highest position in the IDF, under Chief of Staff Chaim Laskov in May of 1959. In this position he was tasked with finding solutions to every problem of all facets of the defense forces from a strategic position. His priorities in this arena included: building a superior army; ensuring current security; fostering ties with armed forces around the world; and political aspects of the military task. He also attempted to reduce Israel’s dependence on France, who had been the country's major arms supplier during the 1950s and 1960s, turning instead to the United States. In 1961 Rabin became IDF's deputy chief of staff, and served as chief of staff from 1964 to 1968. He devoted his first three years in this position preparing the IDF for all possible contingencies. In this position he sought to strengthen the organization, changing its structure. He developed a separate military doctrine along with new training and combat methods. New weapons were acquired, while top priority was given to the Air Force and the Armored Corps. The Arab states strongly opposed the National Water Carrier Project, a pipeline system created to transfer water from the Sea of Galilee in the north of the country to the urban center and arid south and to enable efficient use of water and regulation of the water supply in the country. Syria attempted to divert the Jordan River tributaries, which would block the flow of water into the Sea, sharply reducing the capacity of the carrier, but failed because of IDF counter-operations under Rabin’s command. Under his command, the IDF achieved an overwhelming victory over Egypt, Syria and Jordan in the Six-Day War in 1967. During the buildup to the war Rabin had suffered a nervous breakdown, caused by mounting pressure over his inability to prevent the war, and was incapacitated for 48 hours. His incapacitation was not disclosed to the public, and he resumed full command over the IDF. The early 1960s saw rising tension in the Middle East, with numerous incidents occurring on Israel's northern border with Syria. These clashes increased at the beginning of 1967, including one which involved the Israeli Air Force shooting down six Syrian jet fighters that invaded its air space. Soon afterward, the Soviet Union gave the Arabs disinformation about Israeli troop formations along the northern border, implying that Israel intended to launch an all-out attack on Syria. Damascus sought the assistance of the Egyptian president, Gamal Abdel Nasser, urging him to launch war against Israel. President Nasser responded by massing troops in the Sinai, which contravened the 1957 agreements. He expelled the United Nations forces that had been based in the Sinai since 1957 as a buffer between the Egyptian and Israeli armies, and spoke of conquering Tel Aviv. Egypt, Syria, Jordan and Iraq signed mutual defense treaties, leaving Israel standing alone as danger mounted for a full-scale attack. Rabin recommended that a preemptive strike be ordered. However, the government was attempting to garner international support before resorting to force, especially in light of the United States' promise to guarantee the freedom of navigation in the Strait of Tiran. It was determined that Prime Minister Levi Eshkol was ill-suited to lead the nation during this time of national emergency. Under public pressure a national unity government was formed with Moshe Dayan as minister of defense. This government accepted Rabin’s advice to attack. On June 5, 1967, virtually all of the air force’s combat planes took to the air in a massive assault on Arab air forces. Taken by surprise, most of the Arab planes were destroyed while still on the ground. With the resulting air superiority, the Israeli armored and infantry forces had little resistance in invading the Sinai. The Egyptian army was defeated within days and pulled back to the Suez Canal. Despite requests from Israel not to get involved, the Jordanian army opened fire in and around Jerusalem. Within two days, IDF paratroopers stormed and conquered East Jerusalem, reaching the Western Wall in the Old City. Rabin was among the first to visit the conquered city, delivering a famous speech on the top of Mount Scopus at Hebrew University. Soon, most of the West Bank was invaded and occupied. With Egypt and Jordan out of the way, the IDF attacked the Syrians on the Golan Heights, removing their threat to the northern Jordan Valley. Within six days, Israel had been forced to fight on three different fronts and defeated three different armies - those of Egypt, Syria and Jordan. This victory is considered one of the greatest in world military history, and was reached under the command of Rabin as IDF chief of staff. Rabin had become a national hero, and the Hebrew University of Jerusalem later conferred him an honorary doctorate. The Six-Day War transformed the State of Israel. In addition to demonstrating invincible military supremacy over the Arab states, its territory tripled in size. Most of the Land of Israel (Eretz Israel), including a reunited Jerusalem, now came under Israeli rule. By war's end, Israel controlled the West Bank, the Gaza Strip, the Sinai Peninsula and Golan Heights. Considered settled with the War of Independence, the dispute over the country's borders was reignited. The military victory began a new stage in Israel’s political and diplomatic life; the geopolitics of the region are affected to this day. After 27 years of service in the IDF, Yitzhak Rabin retired in 1968. He was appointed as Israel's ambassador to the United States, a post he held until 1973. Rabin considered Israel’s relationship with the United States of utmost importance. Cold War rivalry was at its height, and a strong relationship with the U.S. would balance Soviet support for the Arab nations. He succeeded in dramatically increasing U.S. aid to Israel, as Washington became the major supplier of arms and military equipment. From a diplomatic standpoint, Washington deepened its perception of Israel as its most important and trustworthy ally in the Middle East. During Rabin's tenure as ambassador, he also made serious attempts to open a peace process with the Arab states. When he returned from Washington, D.C. in 1973, Rabin joined the Labor Party. In the election he placed as number 20 on Labor’s list for the Eighth Knesset. The Yom Kippur War, also known as the 1973 Arab-Israeli War and the Fourth Arab-Israeli War, was fought from October 6, to October 26, 1973. The war began on the Jewish holiday of Yom Kippur with a surprise joint attack by Egypt and Syria crossing the cease-fire lines in the Sinai and Golan Heights, respectively, which had been captured by Israel in 1967 during the Six-Day War. The Israeli air force was neutralized by Soviet SAM missiles possessed by both the Egyptian and Syrian armies. Fierce tank battles were fought in both the Sinai and Golan Heights. Although Israel emerged victorious three weeks later, the war caused a vast rupture within its society; suddenly, the country's unwavering faith in the IDF was shattered. This resulted in the concept that perhaps the solution to the Israeli-Arab conflict was to be found not in the military arena, but in the diplomatic arena. Rabin, who had not served in any official capacity during the war, was appointed minister of labor in Prime Minister Golda Meir’s government. Meir was forced to resign due to the Agranat Commission Report as well as to the civil protests that spread across the country over Israel’s lack of military preparedness. Rabin was elected as head of the Labor Party, and went on to become prime minister. On June 2, 1974, Rabin was elected party leader and succeeded Golda Meir as Prime Minister of Israel. During this first term he conducted exhausting negotiations over post-war interim agreements with Egypt and Syria, which were mediated by U.S. Secretary of State Henry Kissinger in his well-known shuttle diplomacy. The interim agreement with Egypt was the precursor of the Middle East peace process that would eventually lead to the Camp David Accords. While seeking peace with the Arab states, Rabin nonetheless employed an unyielding policy against the Palestinian Liberation Organization (PLO), which, in those years, operated as an international terrorist organization that did not hesitate to attack civilians. While Rabin refused to negotiate with terrorists, he had no hesitation in dealing with officially recognized Arab leaders, such as King Hussein of Jordan. Rabin and Hussein eventually forged a deep friendship. 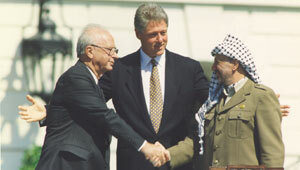 Rabin accepted territorial compromise on the West Bank in exchange for peace. Israel's refusal to bend to terrorism was dramatically demonstrated during Operation Entebbe of July 1976. This was the most dramatic event during Rabin's first term of office. On his orders, the IDF rescued passengers of a plane that was hijacked to Uganda by terrorists belonging to the Popular Front for the Liberation of Palestine and the German Revolutionary Cells (RZ). He was lauded by many for his country's refusal to capitulate to terrorism. 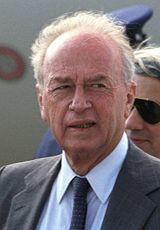 Two crises forced Rabin to resign from office in 1977. First, the arrival of four American F-15 fighter jets on the Jewish Sabbath led to the breaking up of his coalition. The second situation was the discovery of a U.S. dollar bank account held by his wife, an act prohibited at that time by Israeli currency regulators. Rabin took responsibility and resigned from office. He was later hailed by many commentators for his resignation, who described his response as a reflection of his character of integrity and responsibility. For the next 7 years, Rabin served as a regular member of the Knesset. He remained quietly in the background, investing a great deal of time in his family. He also wrote essays on current affairs, politics and strategy. A national unity government was formed in 1984 and lasted until 1990. Yitzhak Shamir and Shimon Peres led these governments, with Rabin appointed as minister of defense. One of his major burdens was the disengagement of the IDF from a war of attrition in Lebanon, which it had invaded following the attempted assassination of its ambassador to the United Kingdom, Shlomo Argov by the Abu Nidal Organization in 1982. Known as the Shalom Hagalil Operation, or Operation Peace for the Galilee, the war had become a burden to Israel, with an initial unsuccessful withdrawal attempt in May 1983. Rabin and Peres finally began withdrawing most of Israel's troops in January 1985. By June of that year all troops had left Lebanon, with the exception of a narrow Security Zone which Israel considered a necessary buffer against attacks on its northern territory. The First Intifada, which lasted from the end of 1987 until 1991 in the occupied territories, caught Israel by surprise and rapidly escalated to an alarming magnitude. This Palestinian popular uprising garnered huge international attention, while Israel’s military and political leaders themselves were slow to comprehend its magnitude and significance. Expected initially by both Israeli and PLO leadership to be short-lived, the uprising soon took on a life of its own. Rabin took the stance that an iron-fisted policy was necessary to suppress the uprising, ordering the IDF to respond to Palestinian assaults "with determination." Jordan's King Hussein made the surprise announcement that his country was relinquishing its sovereignty over the West Bank, which had been Israeli-occupied since the Six-Day War. This prompted a shift in Rabin's thinking - that the answer to violence was to be found around the negotiation table. In 1994 he and Hussein signed an agreement ending the hostility between the two countries. A second national unity government was formed following the 1988 elections. Rabin continued as minister of defense. The following year, he presented a plan for negotiations with the Palestinians. This plan was the beginning of the peace process and laid the foundation for the Madrid International Peace Conference. The core of the plan centered upon fostering credible local Palestinian leadership which was separate from the PLO, and which called for elections in the territories. In 1990 the Labor Party made an attempt to topple the government, causing its collapse. The Labor Party, including Rabin, returned to the opposition benches. 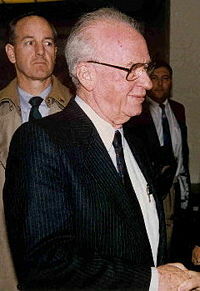 From 1990 to 1992 Rabin was a Knesset member and a member of the Foreign Affairs and Defense Committee. This time he used the opposition years to battle for the leadership of his party that Shimon Peres held since 1977. Rabin was elected prime minister of Israel for a second time on July 13, 1992, at the age of 70. He established a coalition government with Meretz, a left-leaning social democratic party, and Shas consisting of primarily ultra-orthodox Sephardi and Mizrahi Jews - a socially conservative and somewhat dovish party. His first action in office was the reorganization of priorities. Peace with the Palestinians was at the top of the list. A realignment of socioeconomic priorities was also high on the agenda. Rabin believed that the country's economic future required an end of the state of war. Israel at this time was receiving a large influx of immigrants from the former Soviet Union. Resources that had been poured into the settlements were moved to support the new immigrants, as well as to the education field. A successful pursuit of peace required, Rabin thought, a distinction between Palestinian extremists and fundamentalists, and the moderates in the PLO. Though he had reservations about the trustworthiness of Yasser Arafat and PLO intentions, Rabin agreed to secret negotiations with PLO representatives. Held in the spring and summer of 1993 in Oslo, Norway, these talks gave birth to what became known as the Oslo Accords, or Declaration of Principles. The Accords were finalized on August 20, 1993, and subsequently officially signed at a public ceremony in Washington D.C. on September 13, 1993, with Yasser Arafat signing for the Palestine Liberation Organization and Shimon Peres signing for the State of Israel. It was witnessed by Secretary of State, Warren Christopher for the United States and Foreign Minister Andrei Kozyrev for Russia, in the presence of U.S. President Bill Clinton and Rabin. The Accords, which guaranteed Palestinians self-rule in the territories for a period of five years, are considered one of the major accomplishments of Rabin's public career. However, there were extremists who opposed the peace process due especially to the Israeli government's agreement to gradually pull out of the Gaza Strip, Jericho and the West Bank. These extremists began a campaign of terrorist attacks. Rabin vowed to pursue the peace process as if there was no terrorist intrusions. On the other hand he continued fighting terrorism full-force, reflecting his life-long refusal to bow to terrorism. The Gaza-Jericho Agreement, authorizing the implementation of the first stage of the Accords - Palestinian autonomy in Gaza and Jericho - was signed May 4, 1994. The IDF withdrew from most of the Gaza Strip, but continued to defend the Jewish settlements remaining in the region. On September 28, 1995, Israel and the PLO signed the Oslo B Agreement, which expanded West Bank areas under control of the new Palestinian Authority. Rabin's determined pursuit of peace with the Palestinians, even when opposed by Jewish factions, opened the door for a diplomatic breakthrough that led to the onset of peace talks with Jordan. After several months of negotiations between Rabin and Jordan's King Hussein, a full peace treaty between Israel and Jordan was signed on October 26, 1994. Two months later, the Nobel Peace Prize was awarded jointly to Rabin, Peres, and Arafat. Meanwhile, Rabin continued exhaustive efforts toward peace with Syria. He was prepared to exchange territory for a peace agreement with that nation, dependent upon acceptance by the Israeli public. He guaranteed a referendum before any withdrawal from the Golan Heights. Though his peace policy received broad support from the majority of Israelis, it enraged a number of factions who opposed compromise with the PLO and territorial concessions. These included the religious extreme right, many of whom lived in settlements in the West Bank, Gaza and the Golan Heights - the areas Rabin had promised to remove from. There was also opposition from among the Palestinians, mainly Hamas and the Islamic Jihad. Their series of bombings only served to increase the frustration and anger of Israelis who considered the peace process a failure. Yitzhak Rabin was in Kings’ Square in Tel Aviv on the night of Saturday, November 4, 1995 attending a rally with tens of thousands of peace supporters. At the conclusion of the rally, as he descended to his vehicle, he was shot by Yigal Amir, a radical opposed to the peace process. Rabin's assassin, Yigal Amir, was a right-wing Israeli radical who had strenuously opposed Rabin's signing of the Oslo Accords, who was attending a rally promoting the Accords at Tel Aviv's Kings of Israel Square (which was renamed “Yitzhak Rabin Square” after his death). Rabin died of massive blood loss and a punctured lung on the operating table at the nearby Ichilov Hospital in Tel Aviv. The assassination was a shock for most of the Israeli public, which held rallies and memorials near the site of the assassination, his home, the Knesset, and the home of the assassin. Rabin's funeral was attended by many world leaders, among them U.S. president Bill Clinton, Egyptian president Hosni Mubarak and King Hussein of Jordan. He was a man of courage, a man of vision, and he was endowed with one of the greatest virtues that any man can have. He was endowed with humility. He felt with those around him, and in a position of responsibility, he placed himself, as I do and have done, often, in the place of the other partner to achieve a worthy goal. And we achieved peace, an honorable peace and a lasting peace. He had courage, he had vision, and he had a commitment to peace, and standing here, I commit before you, before my people in Jordan, before the world, myself to continue with our utmost, to ensure that we leave a similar legacy. And when my time comes, I hope it will be like my grandfather's and like Yitzhak Rabin's. 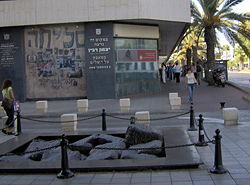 A national memorial day for Rabin is set on his death date, and not only the square in which he was assassinated was named after him, but many streets and public institutions as well. Rabin is remembered by most as Israel's great man of peace, despite his military career. After his tragic death, Rabin became a national symbol, especially for the Israeli left. After his untimely death, the peace process he had set into motion slowly ground to a halt, giving rise to the Israeli right as prime minister Benjamin Netanyahu came to power in late 2005. 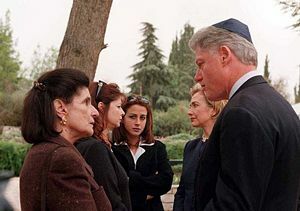 Late in Bill Clinton's presidency, he and Netanyahu's successor, the moderate Ehud Barak, joined Yasser Arafat in a revival of the Camp David peace talks, but in the end, the talks were inconclusive. A lack of progress from 2001 to mid-2008 in reaching a final settlement of issues with the Palestinians, means that Yitzhak Rabin's legacy still awaits fulfillment. ↑ CNN.com. November 6, 1995. ’Soldier for peace’ Rabin buried Retrieved February 12, 2008. ↑ CNN.com. November 5, 1995.Rabin’s death leaves void Retrieved February 12, 2008. ↑ Naomi Segal, November 17, 2000. Leah Rabin dead at 72 Jewish Telegraphic Agency. Appeared in Jewish News of Greater Phoenix Retrieved February 8, 2008. ↑ Menachem Begin. The Revolt. (1978), 412. ↑ Yitzhak Rabin Center for Israel Studies. “Soldier of the Homefront: The Palmach 1941-1948.” Retrieved December 29, 2006. ↑ David Horovitz, (ed.). Yitzhak Rabin: Soldier of Peace. (London: Peter Halban Publishers, 1996. ISBN 1870015622), 26. ↑ Israel Democracy Institute. Summary from the Israel Democracy Institute Retrieved February 9, 2008. ↑ Israel Diplomatic Network. Special Newsletter: Yitzhak Rabin Retrieved February 11, 2008. ↑ International UNESCO Education Server for Civic, Peace and Human Rights Education. Yitzhak Rabin – from solider to Nobel Peace Prize Laureate Retrieved February 12, 2008. ↑ Yitzhak Rabin Center for Israel Studies. A Nation Grieves Retrieved December 29, 2006. Jewish Virtual Library. Rabin Biography Retrieved February 8, 2008. Yitzhak Rabin Center for Israel Studies. Biography of Yitzhak Rabin Retrieved December 29, 2006. Israel Diplomatic Network. Special Newsletter - Yitzhak Rabin Retrieved February 10, 2008. BBC. November 4, 2005. Israel marks Rabin assassination Retrieved February 9, 2008. Begin, Menachem. The Revolt, 7th ed., translated by Samuel Katz. Steinmatzky's Agency Limited, 1977. Dromi, Uri. November 5, 2005. "Still craving peace 10 years after Rabin." New Straits Times, p. 20. One of the last recorded interviews with Yitzhak Rabin — a 6-minute recorded interview with David Esing, one month before the assassination. This page was last modified on 24 October 2016, at 16:35.